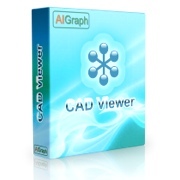 AIGraph CAD Viewer is a professional DWG viewer, and DGN viewer. It's the best tool for projects that require a powerful viewing, measuring, and printing application for MicroStation, AutoCAD. Open any of the world's most commonly used CAD files, including DGN, DWG, and DXF; Measure the distance between two points or find the length of a line with just one click;Export CAD files to many other file format, such as JPEG, PDF and SVG. If you need to view, print CAD files but frustrated by the complex, huge cad software, AIGraph CAD Viewer is just what you want! It's a easy to learn CAD file viewer that can let you view,measure and print the content of DWG, DGN files. With AIGraph CAD Viewer, you can read /write all AutoCAD DXF and DWG versions 2.5 to 2010. Viewer supports dgn version 7 and version 8. Generate Adobe PDFs from your CAD files with just the touch of a button. AIGraph software has been developing graphic design software solutions since 2003. We are focusing on client satisfaction. Try it Now! Buy Now! Open any of the world's most commonly used CAD files, including DGN, DWG, and DXF. Easily translate your CAD files “from” and “to” other CAD file format with AIGraph CAD Viewer. Work with CAD data from a wide variety of systems to create new designs based on translated data, accelerating your design process, saving time and development costs, and increasing productivity. You can create PDF from any CFAD file with CAD Viewer. It provides rich set of options to export PDF files. With AIGraph CAD Viewer, you can browse the contents of cad files as easily as you browse files in the Windows Explorer. Open multiple cad files and then view all of the layers, blocks, linetypes, styles, views, and user coordinate systems currently in use.